The bed bug (Cimex lectularius) has been a parasite of humans throughout written history. Its adaptation to humans is so complete that its bite is not noticed until well after the bug leaves its victim, if it is noticed at all. Attracted by the warmth of our bodies and the carbon dioxide we exhale, bed bugs emerge usually at night from hiding places, seeking human blood. While pathogens have been found in bed bugs, the bed bug apparently does not transmit diseases to humans. Prior to the widespread use of synthetic insecticides, this small, brown blood-sucking bug was perhaps the most unwanted pest in America. The insidious bed bug was loathed even more than the cockroach. Although the bug’s impact was greatly reduced by insecticides during the 1940s and 1950s, it remained an occasional invader of homes, hotels and shelters. Pest management professionals now agree that bed bugs have become the most difficult pest to control. Bed bugs (Cimex spp.) feed on the blood of animals including people and pets. Some species, known as bat bugs, feed on bats, and others on birds such as chickens, pigeons, swallows and swifts. All will wander in search of a new host if their primary host leaves or abandons its roost or nest. In structures, bat bugs typically appear in and around attics and chimneys. Though they will bite humans, they do not survive without their preferred hosts. Bed bugs can survive more than a year without feeding, but most adults and nymphs probably do not live more than six months without a meal. This ability lets them wait for transient hosts that periodically inhabit camp cabins, apartments and temporary housing. It also helps them survive transportation. Today, bed bugs “hitchhike” more easily than ever, via public transportation and luggage, and in secondhand furniture, mattresses, bedding and clothing. In multi-unit buildings, bed bug infestations that are not adequately attended to often spread between units with or without human help, making eradication much more difficult and costly. Most people have never seen a bed bug. Adults are wingless, about one-fourth of an inch long, and flat to fit in cracks and crevices where they hide by day. Females typically lay three to five adhesive eggs per day in crevices and depressions. Eggs and newly hatched nymphs are somewhat translucent and only about one-sixteenth of an inch long. After feeding, nymphs become bright red. At night, bed bugs seek warm hosts, leaving their hiding places in mattresses, box springs, bed frames, nightstands, curtains, couches and wall voids, baseboards, carpet edges, door and window frames, picture frames, smoke detectors, electrical switches and outlets, peeling paint and wallpaper. The bed bug painlessly bites its victim, injects saliva to ensure blood flow, and ingests the host’s blood through needle-like mouthparts. During the three to five minutes it takes to complete feeding, the bug elongates and becomes more reddish. It then retreats to its hiding place to digest the meal, and will return to feed in three to 10 days. Reactions to bed bug bites vary among individuals. Many persons show no signs of bites. Others don’t realize they’ve been bitten until redness and swelling appear around the bite, sometimes with intense itching. Some exhibit inflamed swollen spots that may occur in linear series or have a rash-like appearance. Such bite marks, when they appear, may not show for several days after the person is bitten. When bed bugs are suspected, sleeping and resting places should be thoroughly inspected. Check all possible hiding places, mindful that bed bugs, especially the young nymphs and eggs, can fit into very tiny cracks and crevices. Don’t overlook places where pets rest, and where bats or birds have entered structures. In these instances, bat or bird bugs, not bed bugs, may be present. If bats or birds are a source of infestation, they should be excluded from the premises. Note that bats and most bird species are protected by law and should not be killed. Contact the Illinois Department of Natural Resources for guidelines on bat or bird exclusion and removal. 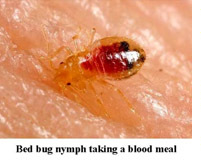 Blood smears on bedding may indicate bed bug infestation, along with brownish black specks (bed bug feces) and the amber-colored “shells” (shed exoskeletons) of bed bugs. 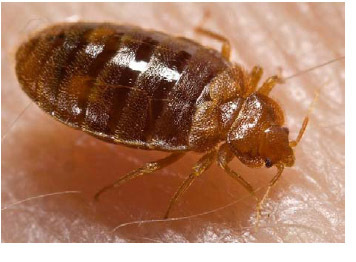 Heavy infestations can be detected by the peculiar musty sweet odor of bed bug secretions. Perhaps more than any other structural pest, the bed bug illustrates the need for an integrated pest management (IPM) approach. IPM employs not a single method, such as pesticide application alone, but combines several of the best means of control, often adopting less hazardous and more effective pest management. Thus the best bed bug management plans incorporate more than one of the effective control methods listed below. Mattress covers or encasements are used to enclose mattresses and box springs. They can be purchased online or from stores that sell home furnishings and bedding. Good encasements are made of soft material and have zippers that stay zipped, preventing bed bug escape. If bed bugs are found or suspected on mattresses and box springs, both can be sealed using encasements. Often box springs are the bed bug’s primary hiding place. Any bed bugs inside an encasement cannot bite through it and will eventually die. Encasing mattresses and box springs is often better than treating them with pesticides or throwing them away. Encasements prevent bed bugs from living on mattresses and box springs, and purchasing two encasements is much less expensive than purchasing a new mattress and box springs. Once bed bugs and their hideouts are discovered, a pesticide-free solution is to vacuum and dispose of the bag in a tightly sealed garbage bag or trash container. Vacuuming can pick up bed bugs, but bed bug eggs are less susceptible to vacuuming because they are sticky and adhere to surfaces. Moreover, vacuum cleaners can be sources of bed bug distribution. Not all bed bugs are killed when vacuumed. Those that survive may escape from vacuum cleaners and be transported elsewhere if canisters and bags are not disposed of carefully. In addition, bed bugs and their eggs may remain in the brushes and attachments of vacuum cleaners, where they can be transported to other rooms or units. For these reasons, the decision to vacuum should be carefully considered. Where vacuuming is done, it should be done with great care to avoid spreading infestations. Like vacuuming, steam cleaning is not likely to eliminate all bed bugs from the premises, but it can be a useful supplement to pesticide treatments. Steam can be useful for flushing and killing bed bugs hidden deep in furniture such as couches, where insecticide treatment may be ineffective or impractical. Units that produce “dry” steam are less likely to damage household goods. Steam must be at least 113 degrees Fahrenheit (F), the minimum temperature to kill bed bugs, and care must be taken to reduce pressure so that bed bugs are not literally “blown away” before they can be killed by the steam. Steaming should be avoided around hazards such as electrical outlets. Some infested items can be microwaved to destroy bed bugs. Drying items such as clothing and rugs in a hot dryer for 20 minutes or more also will kill all stages of bed bugs. However, sealing infested items in plastic bags and leaving them in the sun on hot days has not proven effective. Portable heating enclosures, such as the PackTite™, work by heating infested items to temperatures lethal to bed bugs. They are useful for killing bed bugs in luggage, but may not kill all the bed bugs within dense items such as books. Pest management professionals are increasingly looking to heat to control bed bugs. Whole houses and, in some cases, multi-unit structures are heated to temperatures well above those lethal to bed bugs, to help assure uniform heating of household contents. Rooms must be heated for several hours during which bulky contents are turned to help ensure heat penetration deep enough to kill bed bugs hiding inside. Heat treatment is labor intensive and requires special equipment. Typically a generator is used to supply power to heating units (maybe three or four for an average-size house) and fans (about two per room) that circulate the heat, usually between 140 F and 150 F. Higher temperatures can damage furnishings and electronic equipment. Heat treatments of this type are advantageous because they present no pesticide hazard. However, they also provide no residual activity. That is, they do not prevent a structure from being re-infested after it is heat treated. For this reason, residual pesticides are often applied in conjunction with heat treatments. Such applications may not prevent re-infestation, but help control any bed bugs not killed by the heat. A certain percentage of heat treatments, perhaps 10 to 20 percent, fail to kill all the bed bugs present. Often this is due to residents failing to adequately prepare the premises for heating. Abrupt temperature change is best when attempting to kill bed bugs, so the bugs do not have time to adjust to the new temperature. Because it can take many hours for heat or cold to penetrate objects, the process of killing bed bugs is complicated by the density and depth of the items to be heated or frozen. It may take 15 days at 32 F to kill bed bug adults and 30 days to kill bed bug eggs that are unprotected, and much longer to kill those that are hidden inside items. Temperatures below freezing will kill quicker, but less is known about killing bed bugs with cold compared with using heat against them. One method of applying freezing temperatures to bed bugs entails the use of carbon dioxide (CO2) applied as “snow” with a portable application device, i.e., Cryonite™. When applied directly onto bed bugs, the frozen CO2 will kill them. However, this method is similar to using contact pesticides, that is, there is no residual activity. It can kill only as many bed bugs as the applicator can find. The advantage of using this type of freezing device is that bed bugs may be killed quickly and without the use of more hazardous pesticides. Again, this is not a stand-alone treatment, and it is recommended that it be used as a supplemental to the application of residual pesticides and/or other means of control. Pesticides, including liquid and dust formulations, can be applied directly into cracks and crevices harboring bed bugs. For the majority of bed bug infestations, hiring an experienced pest management professional is preferable to doing it yourself. Also known as bombing, fogging and incorrectly as fumigating*, space treatments with aerosols are ineffective against well-hidden bed bugs and can present a fire or explosion hazard. Their use is not recommended. Do not apply pesticides to mattresses, bedding or furniture unless the product’s label specifically allows application to those items. Do not apply pesticides to any surfaces that will be in prolonged contact with people. The effective use of pesticides for bed bug control typically involves a thorough inspection during which the technician will kill any bed bugs he/she discovers, applying contact or residual pesticides directly on the bugs. This is followed by residual application to all cracks, crevices and voids, likely to harbor bed bugs. The pesticide used should be one that remains active for weeks, allowing bed bugs that were missed on the initial inspection to contact treated surfaces long enough to receive a lethal dose. Research has shown that some bed bugs are resistant to the pyrethroid pesticides that have been most commonly used in recent years by pest management professionals. Likewise, pyrethroids such as deltamethrin and permethrin have been among the active ingredients most commonly available in pesticides at retail stores. The ongoing use of pyrethroids has undoubtedly contributed to the resistance we see today in some bed bug populations. To varying degrees, bed bugs have been successfully managed using pyrethroids, but more recently with non-pyrethroid pesticides to which bed bugs show little or no resistance. Even with such integrated pest management plans, bed bug eradication often takes weeks or months, and follow-up inspections and treatment as needed should be performed at two-week intervals – at least until residents see no bites or bed bugs for two consecutive months. Successful control of bed bugs often depends on thorough inspection of the premises believed to be infested. Finding no insects identified as bed bugs does not mean that bed bugs are not present. It can mean that the inspection was inadequate, or that bed bugs are present but so few in number that the inspector missed them. It is not uncommon for even the most diligent and experienced inspectors to fail to find all of the bed bugs present in a structure. Inspection requires knowledge, dedication and time. At minimum an inspection should involve a detailed examination of mattresses, box springs and bed frames, as well as likely hiding places for bed bugs within 20 feet of beds and other places where residents may sleep or rest, e.g., on couches). Clutter-free space will be needed to allow furnishings to be moved and manipulated for inspection. In general, rooms with more furnishings will take more time to inspect. Especially in situations where a large amount of time would be required for a pest management professional to thoroughly inspect a structure, bed bug detecting dogs are sometimes employed. Well-trained and handled dogs can also be of value in structures or units with lesser infestations, i.e., where human inspectors might easily overlook bed bugs because only a few bugs are present. Dogs have been sniffing out insects such as termites for many years, and are now being used as inspection tools for bed bug detection. But while companies using dogs may advertise them as being highly accurate in finding bed bugs, one should not get the impression that dogs are infallible or that they are in all ways superior to human inspectors. Research on the effectiveness of dogs as bed bug detectors suggests that for those who would employ dogs, the message is buyer beware. There appears to be great variance in the accuracy of bed bug dogs, and even well-trained dogs are subject to missing bed bugs and to giving “false positives” (signaling the presence of bed bugs where there are none). It should also be noted that pest management professionals are subject to state regulation, licensing and regulation, while bed bug dog teams are typically unregulated. In Illinois, for example, bed bug detection dogs are regarded as inspection tools, not devices that facilitate the application of pesticides. A few private organizations certify dogs and their handlers as bed bug detectors, holding them to certain standards before awarding certification. But at present, these organizations, like dogs and handlers, are not subject to regulations that govern those who apply pesticides to control bed bugs. Nevertheless, the National Pest Management Association (NPMA) recommends that bed bug detection teams be independently certified and adhere to the minimum standards found in the NPMA’s Best Management Practices for Bed Bugs (see RESOURCES for more info). By itself, trapping is rarely if ever capable of eradicating a bed bug infestation. Bed bug traps are primarily monitoring devices, not control devices. They are useful for detecting the presence of bed bugs, especially for detecting them before they multiply and spread. Unfortunately standard insect monitors (“sticky traps”) are not very good at trapping bed bugs. To date, the best bed bug trap as measured by cost, ease of use, and effectiveness, is the “Climbup™ Insect Interceptor.” This trap resembles a plastic dish and is placed beneath the legs of beds and other furniture on which persons might relax and serve as “bait” for bed bugs. Bed bugs that climb into the dish are unable to climb its slippery inner surface (which is coated with talcum powder). Studies have shown that even inspections performed by trained and experienced pest management professionals often miss some bed bugs, especially in heavier infestations, and that bed leg traps can catch many of those missed bed bugs. Whether you use traps or not, beds and bedclothes should not touch walls or furniture, and bed clothes should not contact the floor. In this way the bed is isolated, forcing bed bugs that attempt to access a sleeping person, to enter the traps, be captured and expire. Wrapping double-sided carpet tape or duct tape around bed legs also can trap bed bugs attempting to enter beds. Other types of bed bug traps include those that do not rely on humans as bait, but instead use CO2and/or other attractants. CO2 is thus far the most powerful lure for bed bugs, as it is the primary cue they follow to locate hosts. Traps that issue CO2 for a period of time are more expensive than Climbup™ traps, but can effectively trap bed bugs when no host is present, such as in common areas, vacant homes or units, offices, schools, and theaters. Thus they can help confirm infestation and eradication. Versions of bed leg traps and CO2 traps can be “homemade” and also effective. Constructing a CO2trap can be much less expensive than buying one that is commercially available, but care must be taken to avoid burning skin by handling dry ice, and the ice will probably need to be resupplied nightly. * Typically used for control of wood-destroying organisms, true fumigation of structures is occasionally performed for bed bug control. Fumigating a structure involves “tenting” it, i.e., draping and sealing it with tarps so that the fumigant, a poisonous gas, can be applied into and contained within the structure where it penetrates the contents and kills all pests within. Like whole-room heat treatments, fumigation has no lasting effect (it leaves no pesticide residue), is labor-intensive, and can damage contents. It is also more expensive, especially in northern states where fumigations are done less frequently. The advantage of fumigation over heat treatment may be that fumigation is more likely to kill all the pests within a structure. Illustrations courtesy of the U.S. Centers for Disease Control and Prevention.